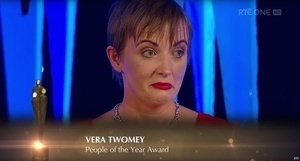 Vera Twomey accepting her ‘People of the Year’ award for her struggle to obtain medicinal cannabis for her daughter, Ava. Vera’s acceptance speech included criticism of Leo Varadkar [who was present] and his government’s policy in this area. RTÉ, in their highlights clip (above), has chosen to edit this out. It was a magnificent speech and took a lot for Vera to speak out… Unbelievable censorship from the state broadcaster. Posted in Misc and tagged People of The Year Award, Vera Twomey at 9:57 am on April 16, 2018 by Bodger.